Our Dear Guest, retro is an ironic view of reality - why should everything be so serious? 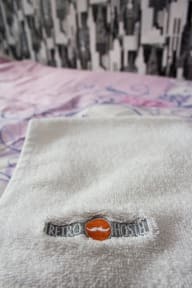 Retro is also a nostalgic look into the past - when its far away it'll be really nice to recall all that time spent in our hostel. So if you only want to be in a good Retro mood, invite yourself and your friends to our hostel. Retro Hostel, is situated in the centre of Poznan, where you can feel the atmosphere of the old town. Retro Hostel is very near such places like: a railway station (PKP), a bus station (PKS), Old Brewery Business and Art Centre, pubs, cafes, cinemas, swimming - pools, museums, theatres and Poznan International Trade Fair - everything within your grasp. A pleasant walk to the Old Market, which is the centre of culture and entertainment in Poznan, will take you only five minutes. Просто отличное соотношение цена - качество. Расположение тоже супер. Bardzo dobrze!